Paul Duvall is Director of Technology Enhanced Learning at the School of Medicine. “Earlier this year I was invited to work with a number of Australian medical schools interested in our use of an e-portfolio platform (PebblePad) for medical and healthcare education. This knowledge exchange visit included work with the University of Sydney, the University of Tasmania (UTAS) and Griffith University in the Gold Coast. Over the past five years we have developed a comprehensive, sustainable and effective approach to workplace-based assessment in the School of Medicine using this e-portfolio system. This approach, enabling medical students to gather verified clinical activity in any location using mobile devices, has attracted attention and interest from many other medical schools and institutions in the UK, and the wider world. The Australian visit was an extension of this interest covering institutions from a large section of the country. On my first morning in Sydney I woke up at 3am, due to jetlag, and set off to explore the city and enjoyed a great walk through the Royal botanical gardens and onto the famous Sydney harbour waterfront. Spectacular! The next day involved the delivery of a public lecture and a half-day workshop working with colleagues from across higher education and other sectors in Australia. Unfortunately, on the morning of the lecture, I came down with an illness that most likely came from a perspiring, coughing gentlemen sitting next to me on the flight over. I still managed to deliver the lecture and facilitated some very interesting discussion with the workshop participants but after returning to my hotel spent the next 48 hours in bed fighting a bug! After recovering from the illness I travelled to Tasmania to work with colleagues in UTAS on medical curriculum developments. This brought the next drama as our connecting flight via Melbourne flew through a lightning storm and heavy turbulence. The captain aborted the landing three times telling us it was ‘a bit bumpy, but we’re gonna give it a go!’ before finally setting down to a huge cheer from the passengers. I was grateful to be alive but the delayed landing led to a missed flight to Tasmania and my luggage left soaking in the heavy rain on the runway. Four hours later I arrived in Tasmania with a case full of wet clothes but I was happy to be in one piece. Feeling slightly like Steve Martin in ‘Planes Trains and Automobiles’ I set about ironing my clothes dry in the hotel room. I had the chance to visit the nearby incredible Cataract Gorge before travelling to the University the next morning. The temperature was below zero in the morning which was ironic considering everyone was in the grip of a heatwave in the UK. The next leg of the journey took me to the Gold Coast to work with colleagues in the Health Faculty of Griffith University. It was 20 degrees warmer in this part of the country and the beachside views were wonderful. Unfortunately while taking a picture of the sunset I put my shoes down on the beach and then watched as a freak wave came to take them out to sea! I was forced to walk back to the hotel, a couple of miles away, bare foot. 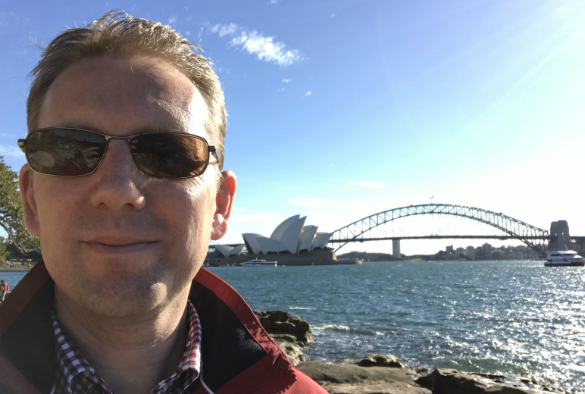 The following day I travelled back to Sydney to continue my work with the medical school and helped the curriculum development team consolidate their thoughts around programmatic assessment models and the sustainable use of an e-portfolio in a clinical environment. I just had time to fit in a visit to the incredible Vivid Sydney light festival that night before flying back to Britain the next day.